Recent years have seen major strides in vest technology, with developments in power supply lightening the load on soldiers and simplifying the recharging process. This progress is set to continue, particularly in situational awareness (SA) and mission command (MC) systems. That’s according to Christopher Hurley, battery team lead for the power division of the US Army Communications-Electronics Research, Development and Engineering Center (CERDEC). Hurley’s team was responsible for the development of the Soldier Wearable Integrated Power Equipment System (SWIPES), an integrated solution designed to simplify the powering process and reduce the number of batteries an individual has to carry. SWIPES was picked as one the US Army’s Greatest Inventions for 2010. 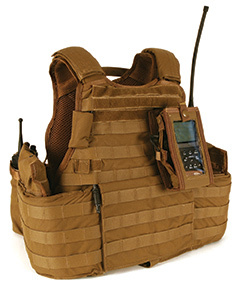 It utilises the MOLLE vest, integrating force protection, electronics and communications equipment with a power source, Hurley said. Cables are routed through the vest, connecting the worn electronics to a single power source via a power management hub. “The worn power source provides a trickle charge to each battery in the loop, extending mission runtime and enabling soldiers to shed batteries for each individual worn device, in addition to spares for each of those batteries,” Hurley told SoldierMod. Hurley said that as the SWIPES concept evolves, soldiers will have the ability to efficiently manage the power distribution between each of their connected devices, and “will also have the ability to track their own power usage”. Hurley pointed to the ability in the future for soldiers to apply SA and MC concepts to power and energy. The SWIPES concept matured into PEO Soldier’s Nett Warrior project, an integrated, dismounted SA and MC system, Hurley said. Nett Warrior connects worn devices into the Conformal Wearable Battery (CWB), a central power source. The CWB is part of the Tactical Power Generation program. It is “a thin, lightweight, flexible battery that integrates seamlessly into a soldier’s body armour”, according to CERDEC. The organisation says that CWB “conforms to the body and can be worn in either the side or chest/back pouches with the ballistic protective plates, virtually invisible and transparent to the soldier”. It significantly cuts the quantities of batteries a soldier needs to carry, “and will reduce the carried battery weight attributed to the size, weight and power” needed to support a mission. There are numerous other areas of research in both the power supply area and in materials. For example, the US Army Natick Soldier Research, Development & Engineering Center is working on the High Performance Fiber Facility (HPFF), which will enable smart wearable technologies. It is also working on Powerwalk, an energy-harvesting device that attaches to the legs and generates power from movement. This is still in development, with field trials set to begin next year.